Grace is a lecturer in Marketing within the School of Business. Grace’s doctoral research focused on environmentally sustainable consumption, but is interested in consumer culture broadly, including marketplace cultures, and consumer-brand relationships. 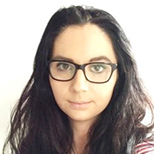 Grace completed her PhD in University College Cork (Ireland), and then moved to London South Bank University in September 2018. Her teaching interests encompass an array of marketing subjects including for example; contemporary marketing, emerging issues in marketing, branding, and consumer behaviour. Grace recently completed her doctoral research, during which she focused on environmentally sustainable consumption. Grace used qualitative methods to understand hedonistic characteristics of an alternative culture of sustainable consumption. More broadly, Grace also has an interest in the study of various marketplace cultures with some exciting new projects in the pipeline.